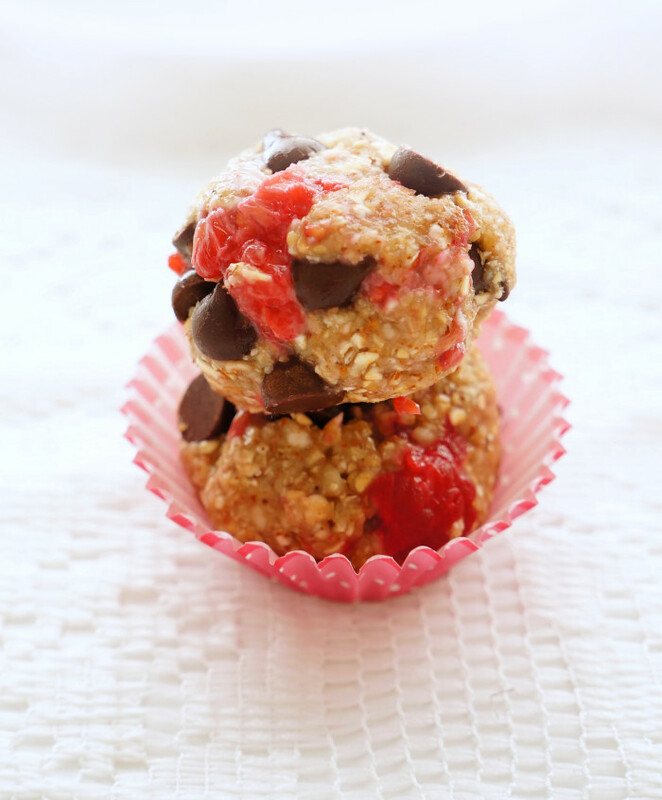 These Raspberry Chocolate Bites make the perfect decadent and healthy little snack or treat…just in time for Valentine’s Day! Valentine’s day is just around the corner so I’ve been experimenting with lots of decadent-but-still-healthy treats! For some reason, these days I’ve had a thing for dark chocolate and berries. I’m not sure why, that combo just seems to scream V-day! The good news is…that combo also screams ANTIOXIDANTS, which can help to prevent disease, and result in nicer hair and skin! The oats provide the fibre to help fill you up, lower cholesterol and keep that blood sugar stable and the almonds contribute some heart healthy fats….perfect for February since it’s heart health month! I whipped up a batch of these Raspberry Chocolate Bites last week and Matt proudly announced that these were his favourite balls yet. It felt like a pretty major achievement. I’ve made a lot of balls over the years. He’s a sucker for raspberries, so I’m pretty sure that’s why these made it to the favourites category. 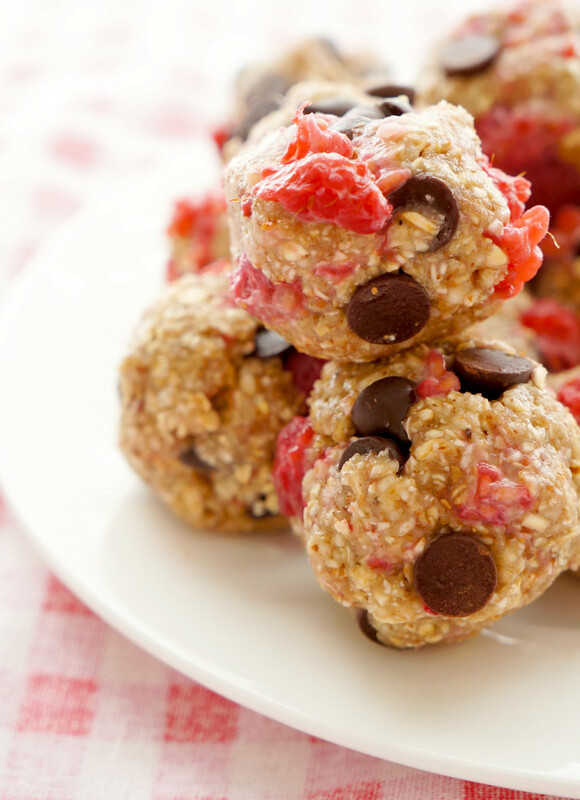 The raspberries add a nice little juicy burst of flavour, which is balanced out perfectly with the oats and dark chocolate. Blend oats, almonds, and steel cut oats in a food processor until fine. Add honey and pulse until the mixture sticks together. Add almond milk, tablespoon by tablespoon, until desired consistency is achieved. It should be slightly sticky. 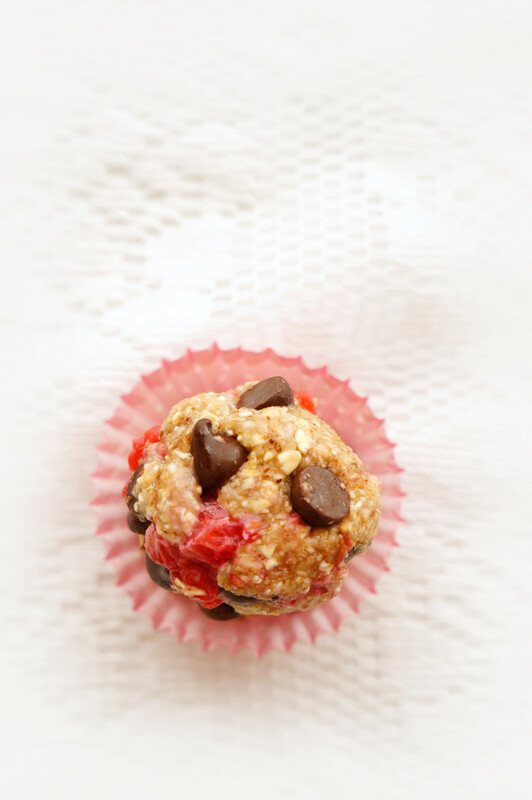 Gently fold in chocolate chips and chopped raspberries. Freeze for 5-10 minutes to allow the bites to harden slightly. 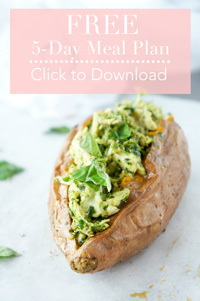 Consume right away or store in freezer for later consumption. Enjoy!